Touchpad is very useful device, but it's usually located right under your hands when you are typing. Accidental touch by palm or wrist moves caret to another place of text! That's why Touchpad Blocker is a must have software for notebook owners who prefer to use touchpad instead of mouse or other pointing devices. 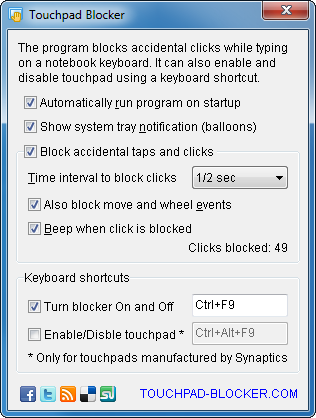 Software helps the user to type text as fast as possible by locking mouse events during a small period after any key were pressed. The touchpad remains enabled all the time! Program is simple as possible, but has some useful options. You can set a length of delay in milliseconds. There is a customizable keyboard shortcut to switch touch blocking on and off, very useful for gameing, designing, painting, and other active work with touchpad or mouse.